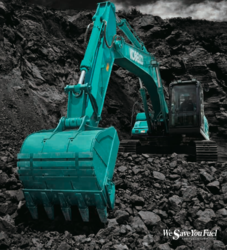 Kobelco Excavator SK380HDLC has become the Preferred Choice in mining applications with its unbeatable fuel economy, higher forces & faster operations. The best in the industry now gets better with Extra Tough Undercarriage by improving the design. More hardened Links, new stronger & durable Upper Rollers, toughened heavier Sprockets and high wear resistance Track Link Pin & Bush, make it ready to set new standards. We are Leading Manufacture and Supplier in Poclain Machine. We are Deal Also Mumbai, Thane, Navi-Mumbai, Panvel, Nasik, Goa, Kalyan, Palghar, Boisar, Tarapur, Ratnagiri Etc.. These rock drills are developed with the help of finest grade components & modern techniques in accordance with set norms of industry. Our offered rock drills are inspected on numerous parameters before delivering at customer’s end. 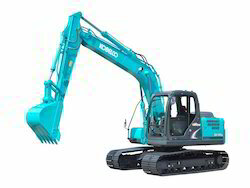 Since it is made by an excavator, the displacement will be much faster than a regular Crawler drill. 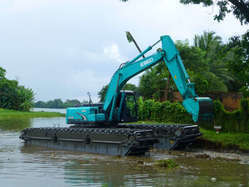 The Amphibious Tracks Hydraulic Crawler can walk or work in water, because the chassis crawler floats on sealed pontoons. 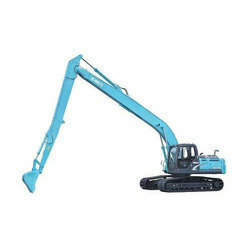 It may swing or even roll over when excavating with no support underneath. It moves using a dual-body boat form buoyancy tank. A reducer drives the crawler chain, allowing free and smooth movement. 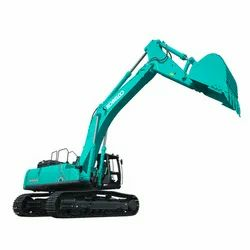 Its upper structure is a modified excavator that allows 360° full rotation and hydraulic operation. 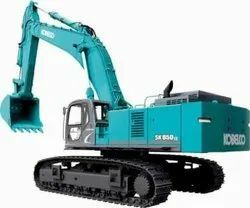 We are Leading manufacture and Supplier in the Earth Excavation Equipment. 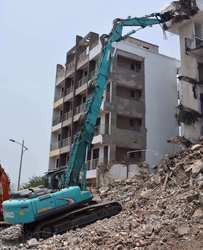 We are Leading Manufacture and Supplier in Long Reach Excavators. 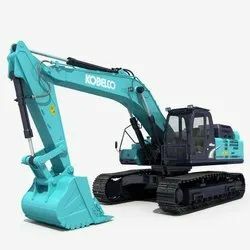 We are Leading Manufacture and Supplier in Hydraulic Excavator. We are Deal in Mumbai,Navi-Mumbai,Thane,Palghar,Boisar,Tarapur,Nasik,Goa,Etc..